Lopez Lomong (photo by Jeff Benjamin) produced another powerful performance on Friday night to take victory in 3:53.86 over a mile at the Sir Walter Miler meeting in North Carolina, clocking the second fastest time ever run in the state to defeat Johnny Gregorek and Sam Prakel. Lomong led 13 men under the four-minute barrier. “I held good position and was able to take advantage of it,” said the Bowerman Track Club athlete, who also noted how near he came to the North Carolina State Record (he missed it by 0.03), and his hopes to be able to break that record himself. “Next time,” said the newly minted Sir Walter Miler Champion. 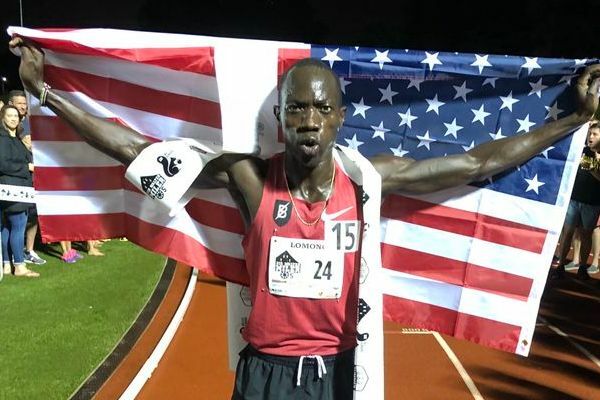 It continues a resurgent 2018 for Lomong, who earlier this summer became US champion over 10,000m and has since competed across a range of distances, finishing fifth at the US road 10K championships before a second-place finish at the Morton Games in Ireland where he ran a 3:56.58 mile. ongrats to Lopez Lomong, on his 3:53.86 mile win, leading 13 Under 4:00, and setting State record! !